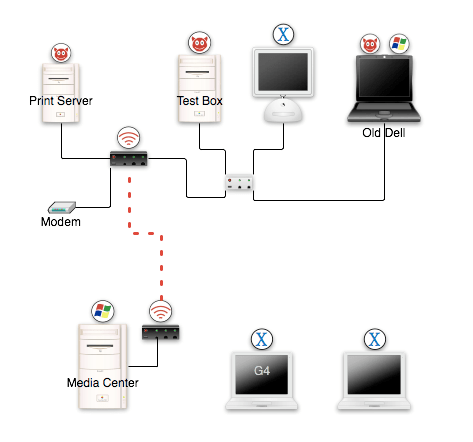 Instead of studying for finals, I decided to create a little diagram of my network at home. I used the trial version of OmniGraffle Pro, with some free downloadable stencils to make a pretty accurate mapping of what we have here. OmniGraffle is actually a pretty nice program, and with a little work, you could do a lot with it. But I don’t think I’ll ever use it enough to justify the $129 price tag. That’s a bit much, in my opinion, I’ll just stick to the trial version. In the diagram, the little black boxes represent WRT54g routers, and the little white box is a little Linksys switch I have. Everything on the top line is in my office upstairs. The hardware on the lower level is downstairs (well the iBook can go anywhere). If you wanted to, you could create much better maps then this one, but in about 30 min. this is what I came up with. So what does your Network look like? to know it, and this works fine. decide if you want to keep the title or not. and then chose the four slides on one page printing option. Genius! a slide and you can print 16 graphs on one page! Genius! The Linksys WRT54G has been considered one of the best home / small office routers availible for the geek with too much free time. Why? Because people found out that it was running Linux. And even better, due to weird copywrite laws that I won’t pretend to understand, they had to release the source code for the software– aka “firmware” –that ran on it. Meaning anyone could take their software, look at it, improve it, and release it again. All for free. And many people did that. Thus, you could take this $50 router, add someone’s improved software, and make it almost as powerful as a router you might pay $600 dollars for. That’s a pretty good deal. And I cried at night. But now, they’ve released the old (good) WRT54G under a new name: WRT54GL! It’s got all the cool features that it did before they crippled it, but it costs $70 now. So, basically they want geeks that want to hack these routers pay a few more dollars to be able to do it. This is still a good thing, because at least you can still buy it somewhere. I have two of the original one’s, and they are great. One is running the original Linksys firmware. The other is connected to the computer we have hooked up to the TV and is running the dd-wrt firmware, so that it can run in client mode and connect to the other router upstairs. This saves me from drilling a hole trough the ceiling to connect this computer to the network. I thought that was a good idea, my wife did not. So, if you are in need of a router, and want the option to someday modify it to make it much more powerful, go grab a WRT54GL today! And if you want more info about the WRT54g and its possibilities, check here or here for a mostly complete list of the firmwares you can get. Its really pretty exciting stuff… If you’re in to routers. And hopefully someday electronic makers will figure out better ways to name their hardware, so we aren’t all left memorizing silly strings of random characters. I mean really, how hard would it be to come up with a naming scheme similar to vechiles for digital cameras, routers and the like. It would be much cooler to say the Linksys “Firebrand” then WRT54g anyday. You are currently browsing the V is for Verbose blog archives for December, 2005.